When your dad is Greg Allman, you better not be going through the motions or riding the family name when you get on stage or in the studio. There are certain expectations that come with being the scion of rock royalty  a lack of forgiveness on the part of fans that doesn't apply to those whose parents aren't famed, respected musicians. But Devon Allman's debut album more than meets any expectations, taking the family's patented sound and propelling it forward into a whole new generation. While Devon sounds remarkably (sometimes spookily) like his father when singing, his band's sound takes in more territory than the Allman Brothers Band. For starters, Devon's guitar-playing is nothing like his late uncle Duane nor longtime ABB guitarist Dickie Betts. It's less linear, more immersed in the blues. 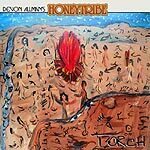 And Devon's compositions cover a lot of stylstic territory: While the opening track, "Torch," is the sort of Southern boogie that the Allman Brothers Band, Government Mule or Derek Trucks might all comfortably add to a set list, "Mahalo" sounds like it came out of the Santana songbook. Add in a cover of the Bob Marley hit "No Woman No Cry," the heavy-metal tinged "Perfect World," the rock 'n' soul of "Heaven Has No Mercy" and the acoustic blues of "511 Texas Avenue," and you've got an album whose sense of unity comes more from the high level of musicianship and Allman's distinctive vocals than any stylistic consistency.